[J. Rhodes & Sons, Ltd., manufacturers of sheet metal working machinery.] Trade catalogue, profusely illustrated with photographs and diagrams, and detailed descriptive text. 409 + pp., 8vo. In blue cloth, with ornate design printed in silver on front cover, around a laid down photographic portrait of 'The late Alderman J. Rhodes, J.P. Founder of the Firm in 1824.' Spine reads: '1824. J. RHODES & SONS, LTD., 1901.' Text embossed on back cover. 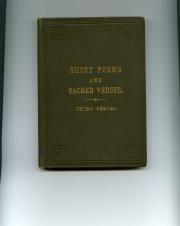 In fair condition, on aged paper, in lightly-worn and aged binding. Two leaves of addenda tipped-in, the first, with text printed in red, headed 'Notice. - American Competition! '; the second carrying text and illustration of the '"Rhodes" "Excelsior" Treadle Guillotine Shear'. [Hampden Gurney Schools, Marylebone, London.] Printed by J. Martin & Son, Portman Printing Works, 18 Lisson Grove, NW. 1889. 18pp., 12mo. Unbound stapled pamphlet on grey paper. The cover carries the names of officers. The pamphlet also features lists of 'Prize Medallists' (boys, 1867-1889; girls, 1869-1889), 'Prize Children', and pupils commended for 'Attendance', together with the programme for the concert, including the words of numerous hymns and songs sung, with names of participants. No copy of this or of any other of the school's Christmas Programmes has been traced on either COPAC or OCLC WorldCat. [Hampden Gurney Schools, Marylebone, London.] The Christmas Concert programmes both printed by J. Martin & Son, Portman Printing Works, 18 Lisson Grove, NW; 1889 and 1890. The prize essay dated December 1890. The other two items undated. The five items, which would make for an attractive display on the theme of Victorian education, relate to the Hampden Gurney Schools, which were founded in 1863, in the newly-named Hampden Gurney Streeet, as a memorial to the recently-deceased Rev. John Hampden Gurney (1802-1862), Rector of St Mary’s, Bryanston Square. The school is now the Hampden Gurney Church of England Primary School, and is located in Nutford Place. ONE: Metal circular medal, 3.75 cm in diameter. In very good condition. [Book] 'Shooting and Salmon Fishing. Hints and Recollections', with Autograph Letter Signed by the author, Augustus Grimble, to the Scottish wildlife artist Vincent Robert Balfour-Browne. Book: London: Chapman and Hall, Ld. 1892. Letter: 28 August 1903; on letterhead of Penrose, Henley-on-Thames. Book: 8vo: xi + 259 pp. Eighteen plates (with the seventh plate, 'A Death Trap', as frontispiece). Fair copy, on lightly aged and foxed paper. In original green binding, gilt, with wear to hinges, corners and head and tail of spine. With autograph inscription of 'V. R. Balfour-Browne, Oxford. February 1901.' A nice association between two notable individuals in the world of field sports. The letter, addressed to 'Dear B. B. ', is 12mo, 2 pp, in bifolium; in good condition; laid down by the blank second leaf to the recto of the book's fly leaf. 8vo, 8 pp. Unbound. Text clear and complete. On aged paper with wear to extremities. According to the title-page the sale contains 'The Encyclopaedia Britannica, Johnson's Poets, Scott's Works, Swift's ditto, Annual Register, British Theatre, and other Works, in various branches of Literature; Prints, Books of Prints, Paintings, Mahogany Cabinets, Antiquities, Gold Repeater, Grand Piano-Forte, by Zeitter'. 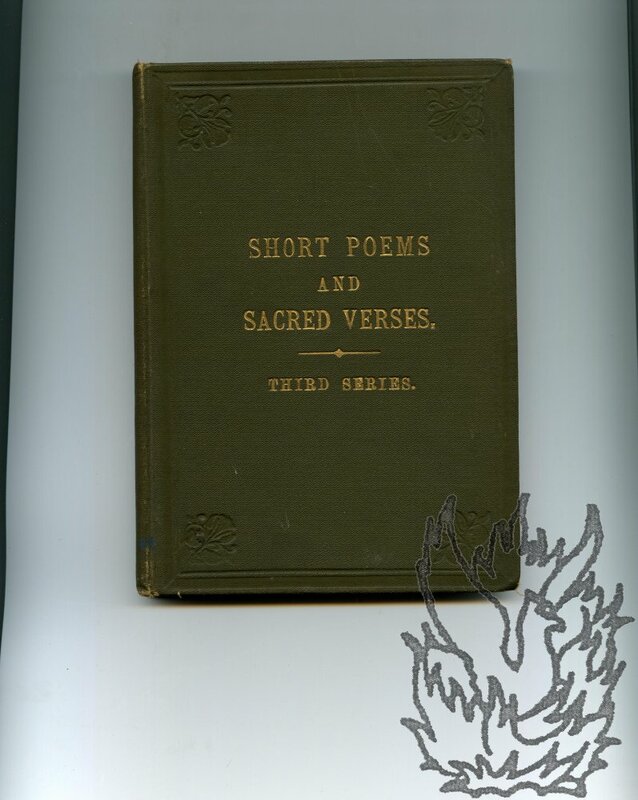 Short Poems and Sacred Verses. Third Series. 12mo: iv + 164 pp. In original green cloth, with the title in gilt on the front cover. All edges gilt. Slightly foxed. Good and tight, in lightly worn cloth. A curious collection, with the index of first lines containing such entries as 'Sweet Edgbaston bells' [this poem dated 1844], 'Dear Varinka', ' 'Twas a boy in a cut-off jacket' and 'They call me little Trottie'. All three series are excessively scarce. The only copy of this third series on COPAC is in the British Library, and the only copy on WorldCat in California. Autograph Letter Signed ('Clarendon') to Edmund Hodgson. 12 June 1867, on letterhead of The Grove, Watford. 12mo, 1 p, 11 lines. Good, with thin strip of discoloration along the outer edge. He is grateful to Hodgson 'for thinking of me'. Nothing would give Clarendon greater pleasure 'than to meet the Members of the Booksellers Provid[en]t Institution at Abbot's Langley', but unfortunately he has to go to London that Friday morning 'in order to keep some engagements that I have made on Saturday'. Autograph Letter Signed ('J. R. Planché') to unnamed male correspondent. Saturday [no date]; Michael's Grove Lodge [Brompton]. Autograph Letter Signed ('J. Clunie') to an unnamed male autograph collector. 20 June 1836; Seedley Grove, near Manchester. One page, on piece of lightly aged paper, roughly six and a half inches by seven. Strip neatly torn away at head (not affecting text, but perhaps bearing recipient's address). Good, with a little damage from breaking of wafer and slight evidence of previous mounting on revese. Thirteen lines. He is sending the selected autographs, and will 'be happy to receive, at your leisure, those of Currie, Daubeny, Mc.Culloch, Flowers, Woodville & Phillips & Jones - or such 5 of them as you can best spare'. Autograph Letter Signed to Charles Hogan; with printed prospectus of one of de Chatelain's works. 18 December 1862; on letterhead of Castelnau Lodge, Warwick Crescent, Westbourne Terrace Road, London. Anglo-French journalist (1801-81) and friend of Mallarme. Letter: two pages, octavo. Good, though on creased, discoloured and spotted paper. The verso of the second leaf of the bifoliate is ruckled and with glue stains showing through from the verso, which is attached to a piece of ruled paper. Reads 'Mon cher voisin | I enclose an order for the Westminster Play for to night, which may perhaps interest you or your son. If either of you are able to go, you should be there early.